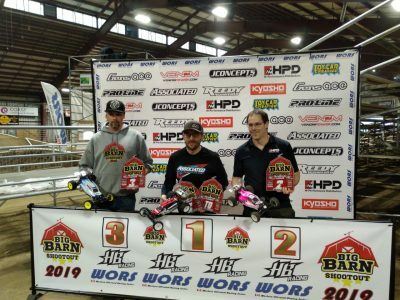 This past weekend was the 2019 edition of the Big Barn Shootout hosted by a dedicated team in the Lower Mainland. The event was Round 1 of the Western Offroad Race Series (WORS). 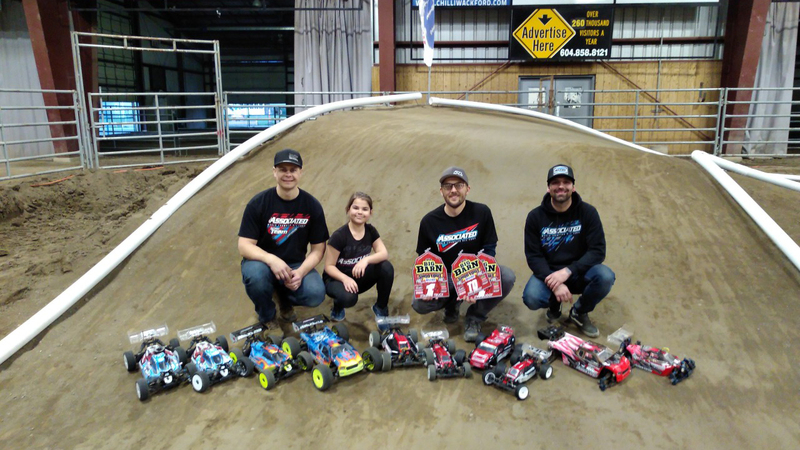 The Series travels though BC with 5 rounds of 10th scale and 8th scale classes. This year saw the Entries top 430+ with 130+ drivers with radios in hand. Entries were from as far as Ontario, the Northwest USA, and the 3 western provinces. Ty joined us as well. 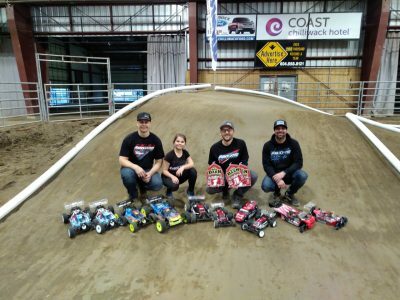 I ran 4 classes including 2wd Buggy Open, Stadium Truck Open, 4wd Buggy Open and Expert e-Buggy. All were on Hole-Shots for the drive wheels, and 4-Rib upfront on the 2wd Buggy. My 2wd and 4wd buggies were both sporting the Air Force 2 rear wing and a lexan Trifecta on my e-Buggy to help them fly over the huge jumps and stay planted on the long straightaway. I joined the event Saturday AM missing Friday practice. My first laps on track were driven gingerly with the 2wd Buggy, followed by Truck. Both would manage a top 3 Q1 result. Next up was the 4wd Buggy and e-Buggy, also with top 5 and top 15 times respectively. Qualifying would finish up with TQ in 2wd Buggy, 2nd in Truck, 5th in 4wd and 14th in e-Buggy for Sunday Mains. Because of the Bump Up format, lower mains filled most of Sunday mornings races. I was able to circle the pits helping out some of the other Kamloops racers in attendance. Last minute prep and setup tweaks to help them get the most out of their Mains. Race 20 would bring my Expert e-Buggy B-main to the line. The group was filled with many contenders for the 3 available bump positions. I would hold onto 2nd and progress to the A Main group. First up was 2wd Buggy A1 main. A Late error in the final minute would allow second place Dan Schellenberg to sneak by; the final two laps would see my B6.1 turn the only sub-41sec lap of the main to close the 6sec gap to less than 0.5sec at the line. A2 would see another close battle with Dan for most of the run, but he would have the bad luck in the final minute and fall back. So we would go to A3 to decide it. Three buggies would stretch out from the group in the first minute with Paul Moria joining the battle for the lead. An error from Dan would let myself and Paul through, with some open track and great traction from my M4 Hole Shots I was able to pull away to a safe distance to take the overall. Truck would be a similar show down between TQ Dan Schellenberg, and myself in P2. A1 would see a nail biter of a last lap for myself and Dan with a photo finish…neither of us knew until the RD announced it. 0.08sec at the line with my Hole Shot equipped T6.1 just nosing out Dan at the line (put your PT’s at the front everyone…it matters!!). With such a close finish, Dan and I both were making changes in prep for A2. Dan found some additional grip and made the most of it with a comfortable win in A2 pushing us to A3. At the tone it was on, immediately making room from the pack Dan and I would follow each other around with the odd bobble and contact, each waiting accordingly. I made an slight error and Dan was able to build a 2sec lead. This would hold until the final minute as we started to gain on bottom end of the field. Dan would suffer from some contact, leaving the inside line clear for a pass and giving up the top spot and the Overall win. 4wd Buggy I would improve from my qualifying position with two 4th place finishes, with A3 being the best run just 4secs behind the top 3 group battling it out. The podium would go to a 3way tie-breaker to decide. This highly competitive class will be one to watch all summer as the top 10 drivers are all capable wining. Expert e-Buggy from 14th on the grid again, I would be able to improve to 10th overall after a tie-breaker. The switch to M4 Buck Shots for the final main definitely improved the buggy’s pace. It was great to share the track with Ty as well. Thank you Ty for joining us at this event. Great weekend of racing. 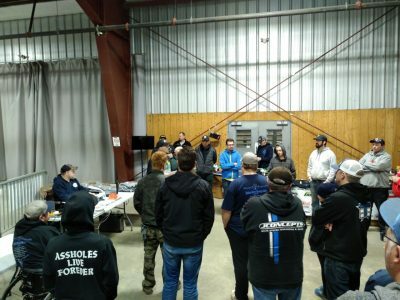 Thanks to the event hosts Outlaw RC in Cloverdale for pulling off this event, and all the WORS sponsors. 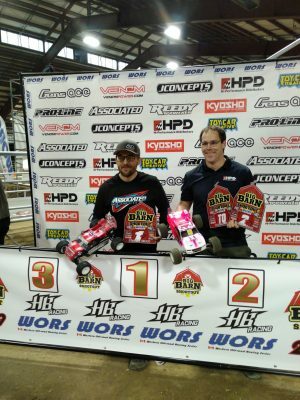 Thank you to my sponsors Team Associated, Reedy Power, Pro-Line and GripworksRC for getting me on the track with Great Products and Support. Also, thanks to Pete, Britt, Paul, Eric and the TVRCRC crew for great times in the Pits and the help throughout the weekend. Next event, Spring Scorcher hosted by KRC in Kelowna, BC. 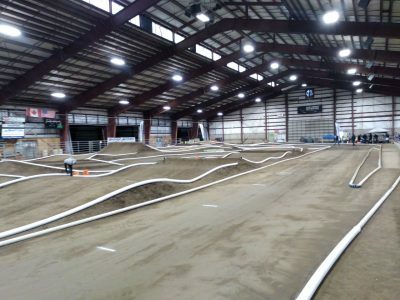 Brian S with another great track layout. Justin of Wilde Events runs a killer program.